In the early 1920s, Frederick Banting and Charles Best demonstrated that a pancreatic extract was effective in treating diabetes mellitus. In 1923, this refined extract—obtained from pig and beef, with insulin as the active constituent—was commercialized by Eli Lilly and crystallized three years later. In 1943, the English chemist Frederick Sanger at Cambridge University began research seeking to determine the amino acid sequence of insulin. At that time, insulin was one of the few proteins that was available in pure form, and it could be readily obtained from Boots, an English pharmacy chain. 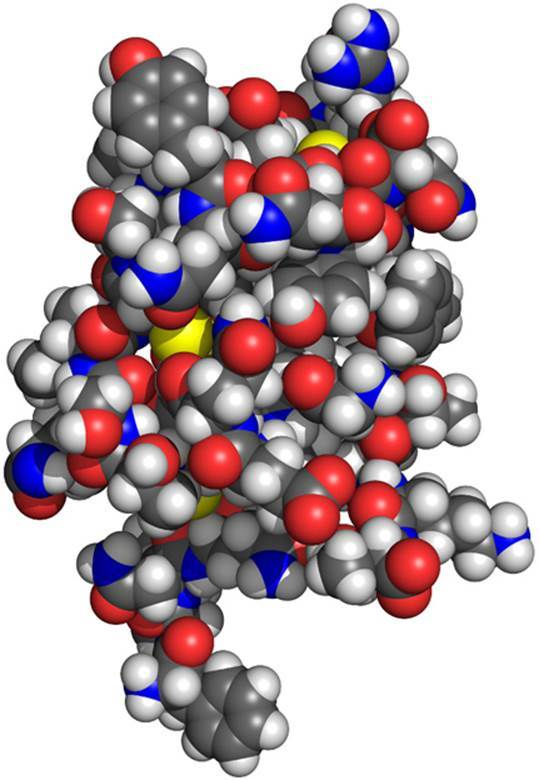 After a decade of effort, in 1951 and 1952, Sanger determined that insulin is composed of two linked chains of peptides (a string of amino acids): an A chain with twenty-one amino acids and a B chain with thirty amino acids. Insulin was the first protein to have its amino acid sequence fully determined, and Sanger concluded that all human proteins have a unique chemical sequence containing any of twenty amino acids. For his work on proteins, especially insulin, Sanger was awarded the Nobel Prize in 1958 (and in 1977 he became the only two-time recipient of a Nobel Prize in Chemistry). Once the chemical structure of insulin was established, it was possible to synthesize this molecule in the laboratory, which was accomplished in 1963. Although the animal-derived insulin was highly effective, it was close, but not identical, to human insulin. Pig insulin differs by one amino acid and beef by three, but these seemingly subtle differences are responsible for allergic reactions in diabetic users. In 1978, researchers from the City of Hope National Medical Center, in collaboration with scientists from a then-recently founded biotechnology company, Genentech, led by the biochemist Herbert Boyer, synthesized the first human protein using biotechnology. In this process, a gene for human insulin was inserted into bacterial DNA; the genetically modified bacteria multiplied and served as a biological factory, producing virtually inexhaustible supplies of insulin. This human insulin, marketed as Humulin by Eli Lilly in 1982, replaced animal insulin. SEE ALSO: X-Ray Crystallography (1912), Biotechnology (1919), Insulin (1921), Plasmids (1952). A three-dimensional model of the insulin molecule. By convention, the following colors represent specific elements: white = hydrogen; black (shown here as dark gray) = carbon; blue = nitrogen; red = oxygen; yellow = sulfur.